That little Claddaugh ring has become an important symbol in my writing life as well, as my husband gave me my own Irish ring after it first appeared in the book, and then my mother continued the tradition over the years by sending me gifts that featured the gold Irish ring. I have necklaces and earrings, a shiny door knocker, wall plaques and kitchen linens and birthday cards. The image of the Irish ring became an ongoing reminder that she believed in me and the story I had to tell. My mother was my first and best research assistant, traveling with me as I traveled around the country on the trail of Doc Holliday. She taught me how to use microfilm readers and how to read census records, how to notate newspaper references and what bibliographic information was important to record. When I couldn’t find the books I needed in the local libraries in Georgia, she borrowed them from the Los Angeles Public Library and mailed them to me so I could photocopy them and keep the information on file, then she paid the fines when they were returned late. She kept me calm as we drove through twisting mountain passes in Colorado and as we crossed paths with rattlesnakes in New Mexico. She pointed out the still-evident wagon wheel tracks along the Santa Fe Trail and walked the dirt streets of Tombstone, Arizona. She uncovered untold stories of Doc Holliday in St. Louis and explored Vapor Caves in Glenwood Springs. and traveling into the past. It’s also why the Premiere Party for Southern Son was held on May 10, 2013, nearly a month before the official launch at the Margaret Mitchell House in Atlanta on the first of June. May 10th was my mother’s birthday, and the Holliday-Dorsey-Fife House Museum where the party was held was a suitable and sentimental venue, as it was my parent’s visit to Georgia and a request to see something historic in Fayette County that had started the Holliday House museum in the first place and inspired the three books of Southern Son that came from it. That evening in early May was a lovely time and place for a party, a warm twilight after a week of cool rain, with a Southern supper set in a big wedding tent on the back lawn of the Holliday House. There was antique music playing, period dancing, costumed tour guides leading guests through the Holliday House, and a book signing of the just-released Southern Son. It all turned out just as I hoped it would and was, as much as any party can ever be, perfect. And saw inside something that took my breath away: a little Irish Claddaugh ring, like the ones my mother had sent me through the years. 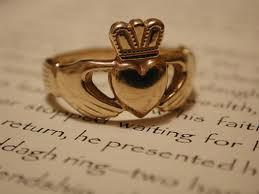 Judy hadn’t yet read Southern Son and didn’t know about the Irish ring in the story or it’s symbolism in my own life. She just felt inspired to buy it for me and present it to me on that night. I think it was my mother’s way of saying that she was proud of me. May the road rise up to meet you, may the wind be always at your back. And may God be with you ‘till we meet again!